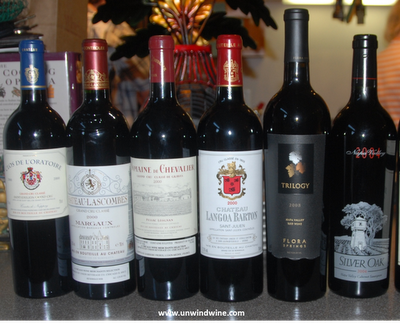 Terry and Lyle hosted our mid-summer wine dinner at their pied-à-terre in Chicago west loop. Lyle grilled steaks on the deck and Terry fixed an assortment of dishes including salads and potato casserole. The antipasto included selected artisan cheeses and olives including tapenade and a crab dip salad with assorted biscuits and breads. The wine theme featured a flight of 2000 vintage Bordeaux complimented by California Napa Valley Meritage (Bordeaux-like) Cabernet Sauvignon blends. 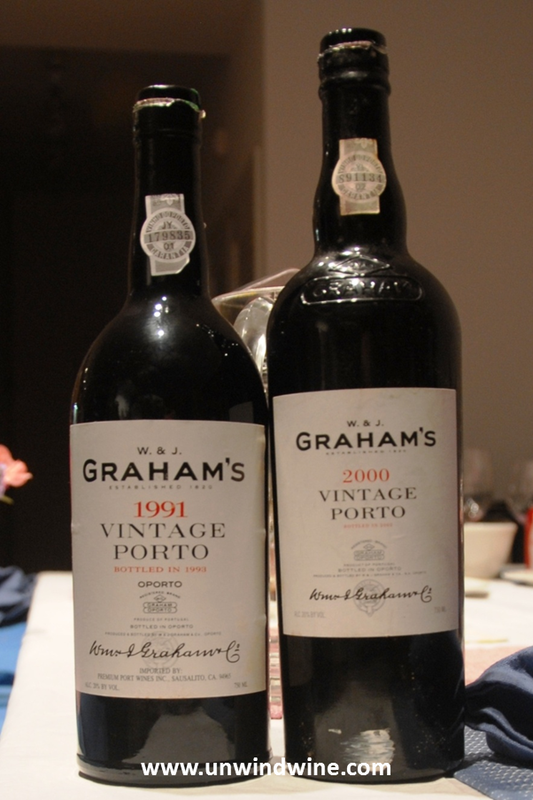 The evening was kicked off with a pair of Champagnes and closed with a pair of Graham Vintage Ports to accompany chocolate cake, fresh berries and whipped cream topping. 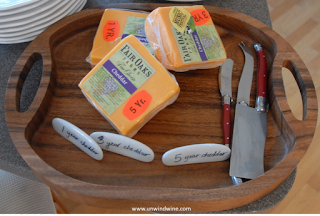 A selection of artisan cheeses included an aged Gouda, Bellavitano with pepper, and three fine aged cheddars - one, three and five years old from Fair Oaks Farms in Northern Indiana. 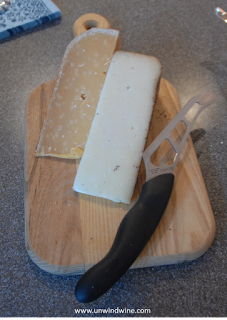 The cheeses were complimented by the a selection of white wines - vintage Brut Champagne, a Vouvray and a Dry Riesling from Finger Lakes region in New York. John brought two Champagnes, a Paul Bara Grand Cru Spécial Club Brut Bouzy Champagne 2002 and Henri Giraud Esprit Brut Rose NV. The Paul Bara was initally yeasty but this melted off to reveal nut, apple, pear and peach flavors with medium bodied, medium acidity. Thirteen Cellartracker reviews averaged 91 points with a medium 90. 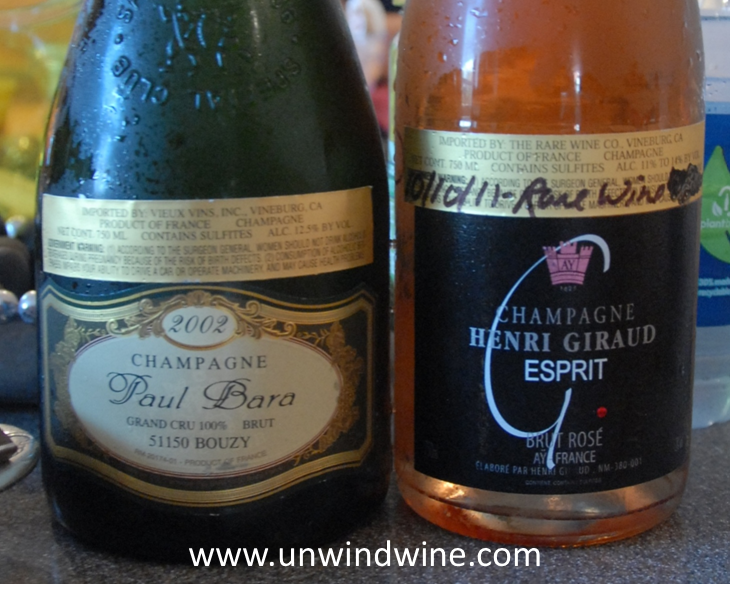 The Henri Giraud Esprit was dark salmon, almost copper colored, started a slight bit yeasty and this too melted off to reveal a hint of smoke accenting the strawberry and hint of citrus notes with medium body and medium acidity. This received average 90 and medium of 89 points from seven Cellartracker reviewers. 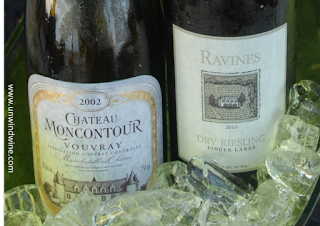 Two other whites were tasted to accompany the first course - Ernie brought a Chateau Moncontour Vouvray 2002 and L & I brought Ravines Finger Lakes New York Dry Riesling 2010. We'll be touring the Finger Lakes region in early August so I sought out a selection from there that could be sourced locally. 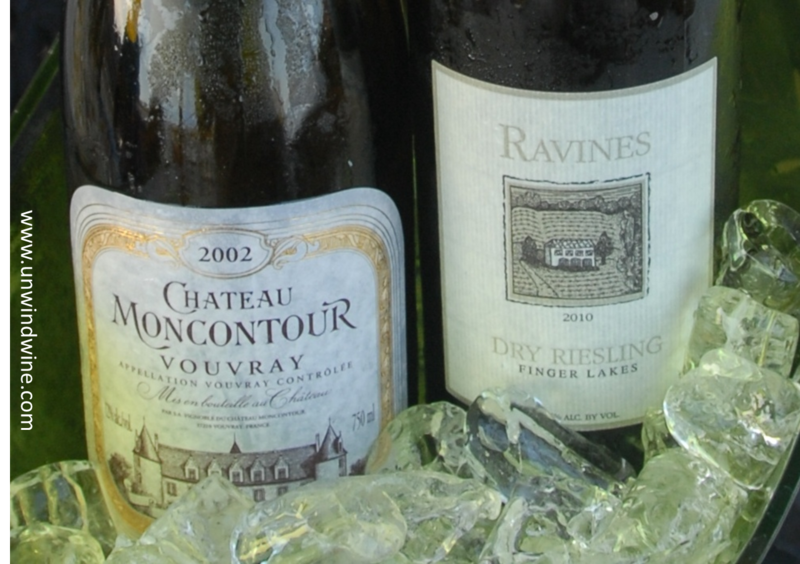 The Moncontour was light lemon colored, medium bodied with hint of citrus, peach and pear notes. The Finger Lakes region is not well known beyond the East Coast but this Dry Riesling 2009 label made Wine Spectator's list of Top 100 exciting wines for 2011 (Nov. 21, 2011). This tasted almost like a Viognier with weak tea color, medium body - mineral and crushed stone character with subdued citrus, pear and apple notes on a very dry pronounced acid finish. Medium and Average review of 89 points from sixteen Cellartracker reviewers including me. Prior to the Bordeaux flight we tasted Flora Springs Trilogy Napa Valley Red Blend 2008. With dark inky color, this exhibited full bodied forward black and blue berry and black currant fruits with a layer of mocha and hints of sweet oak - a pleasant, very tasty, simple easy drinking wine. As indicated by the three grape leaves on the label, Trilogy is a blend of 79% Cabernet Sauvignon, 16% Merlot, and 2.5% Petit Verdot. It was aged for 22 months in 100% new French Oak. We've enjoyed Trilogy since the 80's and still hold vintages dating back to 1990 and 1991 in our cellar. This one is as forward and flavorful as any I remember however perhaps not as complex as some vintages. The flight of 2000 vintage Bordeaux was poured during dinner, consisted of St Emilion, Margaux, Pessac-Leognan, and St. Julian appellations, tasted in that order. Full-bodied, round, ripe black currants, blackberry and black cherry fruits with hints of herbs and spice on a silky smooth tannin finish. 92 points Robert Parker; 92 points Wine Spectator; 90 points Stephen Tanzer; RM 90 points. Medium-bodied, deep ruby/purple-colored, upon opening a huge bouquet of floral and perfume permeate the air - flavors of violet, blackberry, black currant, and black cherry fruits with a layer of vanilla and smooth polished tannins on a a long, berry, vanilla soft oak finish. 90 points Robert Parker: 89 Wine Spectator; Steven Tanzer 87-90; RM 91 points. We discovered this wine through their collaboration with Napa Valley's Darioush. We were honored to attend a gala wine dinner at Everest Room in Chicago co-hosted by proprieter Dominic Laborie of Domaine Chevalier and Darius and Shaptar Khaledi of Darioush. We hold a vertical of this wine starting with the 94 vintage through the 2000 which we presented here. This was the most subdued of the reds, perhaps in a closed period. 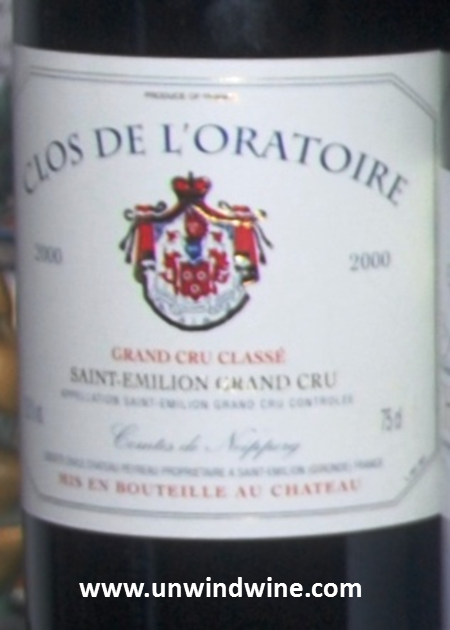 classic Bordeaux character with musty earthy leather and tobacco notes that masked the black berry fruit, cassis and spice notes with a moderate firm tannin finish. Average of 90.8 points with a medium 92 points in 42 Cellartracker reviews - my rating - RM 88 points - perhaps more indication that this bottle was shut down at this time. . 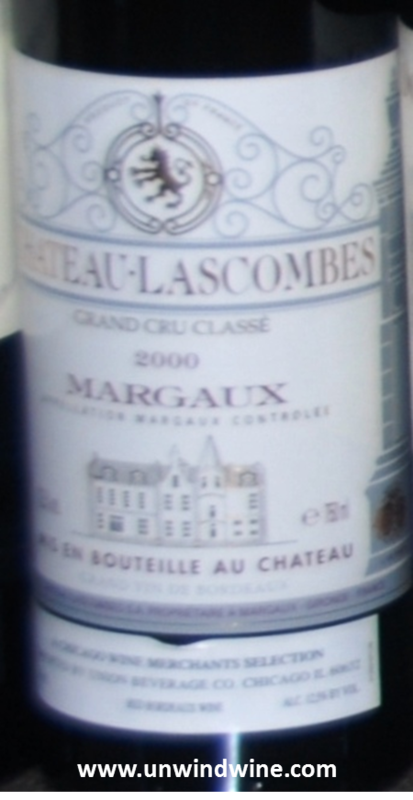 This wine was Number 24 of the Spectator's top 100 wines of 2003! 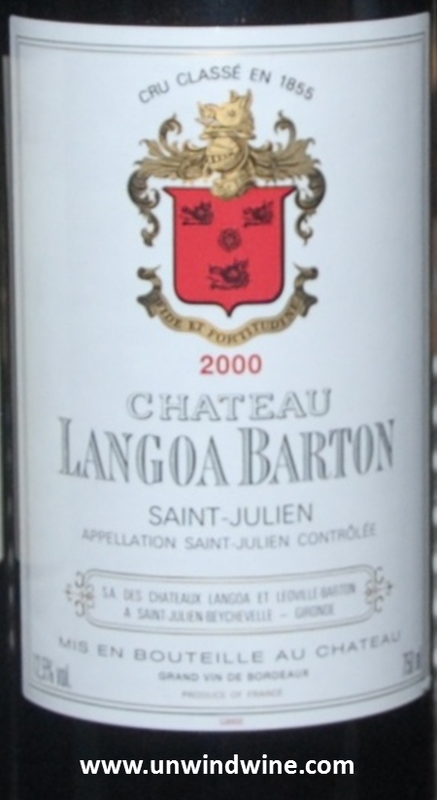 Legendary Anthony Barton owns this and the more renouned Léoville Barton but Langoa Barton sells for a fraction of the price - this is a great investment wine from this vintage. This Langoa is big and intense with dense, rich, aromas and flavors of earthy black and blue berry and black currant fruits with a layer of anise and hint of leather with structured lingering full tannins and acidity on the finish. 94 points Wine Spectator: 91 points from Robert Parker; 90 points RM - average and median of 91 points in 50 Cellartracker reviews. If you love Silver Oak, you'll like this release; if you think Silver Oak is over the top over-oaked, then you won't! Complex, full bodied with dark ruby red color, aromas and flavors of floral, ripe plum and blackberry with a layer of that signature predominant sweet spicy oak, undercurrents of spice, black olive, mocha and vanilla with supple, integrated fine grained tannins and a long finish. Like the Trilogy above, Silver Oak Napa 2004 is also a meritage blend but even moreso (Bordeaux like) with 85% Cabernet Sauvignon, 7% Merlot, 5% Cabernet Franc, 2% Petit Verdot 2%, 1% Malbec. 90 points Stephen Tanzer's International Wine Cellar; RM 91 points. 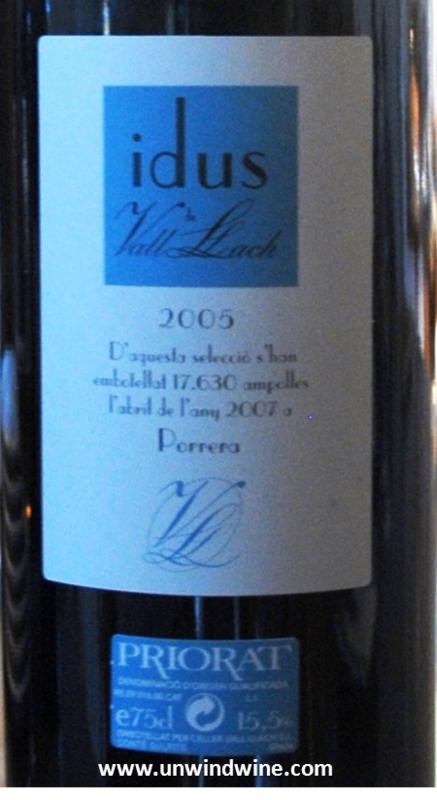 John brought and served a 2005 Proriat Idus from Celler Vall Llach. Dark inky colored, full bodied it exhibit black fruits, creosote tar notes, licorice, black cherry and spice with a hints of smoke and tobacco on the finish. 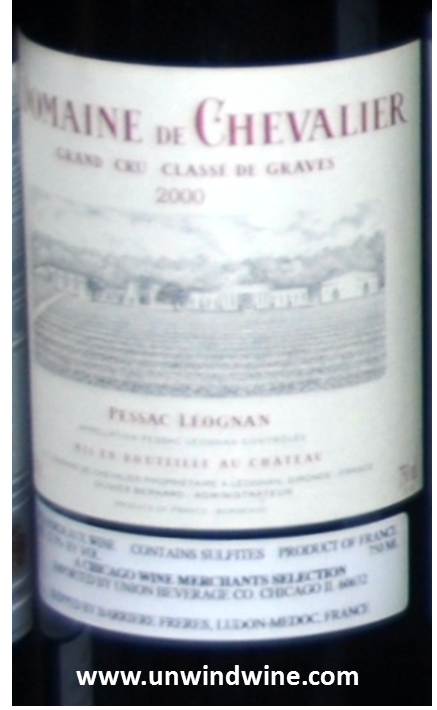 Cellartracker reviewers rated this an average 90.9 points with a median of 91 pts. in 37 notes. RM 87 points. To finish, with chocolate cake, fresh berries and whipped cream, we Lyle served Grahams Vintage Port 2000 and 1991.